DC, VHF, Thermal, and short circuit protection on all channels. The M series amplifiers’ four channels of amplification combined with the external DSP presets for Outline loudspeaker systems provide the perfect solution for many applications. The flexible two/four channel format is ideal for installations where space is at a premium, but where output power is essential. Capable of driving 100 V line systems, making this an ideal choice for all installation challenges. Users of portable systems are also well served by the M series amplifiers: they will appreciate the compact design, high power output, lightweight format and the ease of matching Outline loudspeaker systems, using carefully designed factory preset files. Sonic quality is one of the key characteristics of the M series amplifiers. In addition to this, the compact nature combined with the output power make this an ideal choice for where high performance is demanded within the critical live environment. 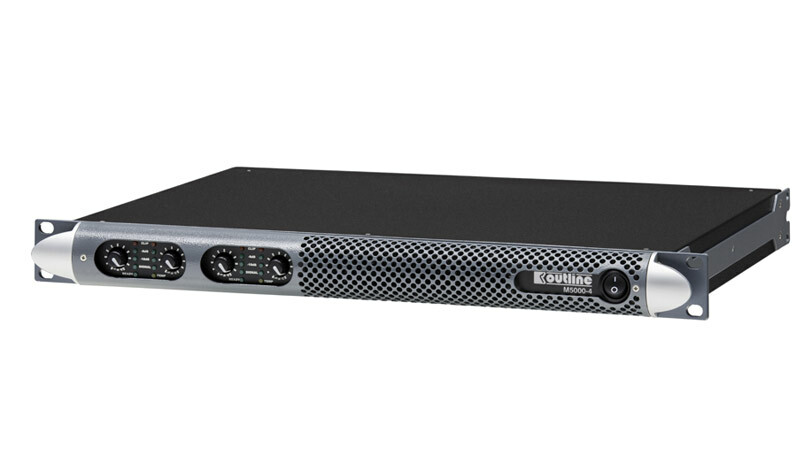 Equally versatile in both portable and installed system configurations, and with its four channels delivering up to 2800 W neatly packed in one single rack unit weighing just over 7.3 kg / 16 lb, the M series amplifiers are a flexible, cost-effective solution for small to medium sound systems. As standard, the M series amplifiers come with fully protected circuit design that includes: AC protection that shuts down the power supply when AC mains voltage is outside operating range. The Clip Limiter prevents severely clipped waveforms from reaching loudspeakers while still maintaining full peak power output, and the DC protection protects against infrasonic signal at the outputs. Added to this the VHF protection protects the loudspeakers against destructive non-audible, non-musical high frequency signals. Finally, the Short Circuit protection acts to protect the amplifier from short circuits or similar events on the outputs (with an automatic protection reset). Bridge mode can also be obtained between CH 1/2 and CH 3/4 by picking up on pins 2+/2- on the NL4 output connector. When running in Bridge Mode the amplifier will deliver 1400 W into a minimum 8 ohm load. Benefitting from these core technologies the M series amplifiers set a class standard in efficiency, leading to low power consumption, and consequently to substantial money savings, all in an eco-friendly way. The legendary sound quality given by the unique, patented Class D output stage design, make the M series amplifiers a superior commercial and practical value.